Are You Struggling To Operate Your Organization Efficiently And Effectively? You want your team to be happy and invested in their positions, but struggles with communication, diversity and efficiency may be affecting staff morale and team retention. Perhaps you have tried taking steps to address the obstacles in your organization, but the problems still persist. 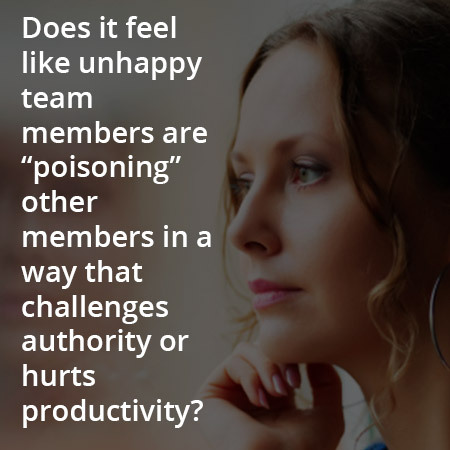 Staff retreats, meetings and incentives may soften challenges for a while, but team issues keep returning, and you can’t find a way to turn things around. The effectiveness of your organization may also be impacted by new leaders struggling to learn the management skills they need to excel in their new role, especially if they were promoted for technical expertise. 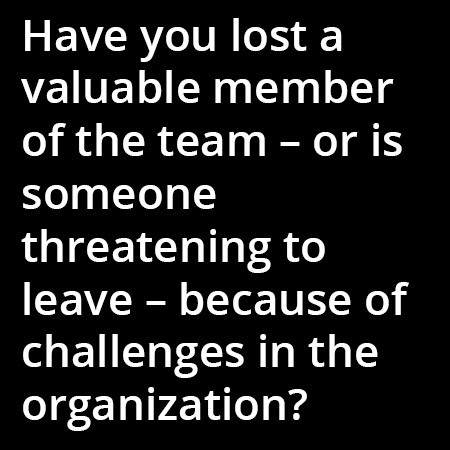 Without effective leadership development and skill-building, your organization’s leaders may struggle to identify and establish their management style, which can cause disconnection and impact the entire team. 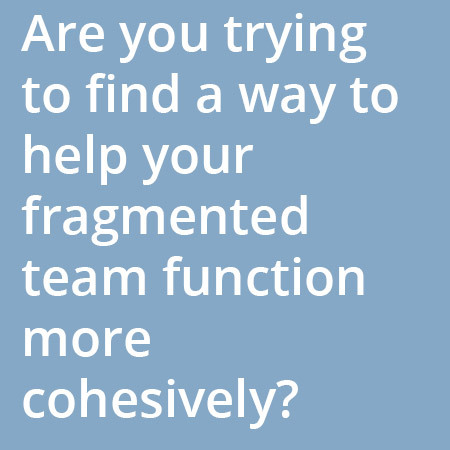 Do you wish you could find a way to address the issues your team is facing, get everyone on the same page and begin functioning as an effective, productive organization again? Whenever a business or non-profit has employees, partners or a team, there will be some degree of communication problems and conflict. You can’t completely eliminate the challenges that come with bringing individuals together, but you can create a team dynamic that fosters effective leadership and communication. Your organization’s leadership can develop the skills, language and an informed stance to effectively negotiate issues in the workplace. Many non-profit organizations, educational institutions and corporations – from start-ups to well-established, growing institutions – are searching for ways to improve their day-to-day productivity and staff morale. From organizational transitions, leadership development and conflict management to work-life balance, providing feedback and developing diversity and cultural competence, there are countless challenges that your company can overcome. With the help of a consultant from Dynamic Transitions in New York City, your organization can proactively develop the diversity and team building skills, leadership and understanding of group dynamics needed to connect your team and thrive in your industry. A consultant can provide an organization a targeted ally who can help them address a particular concern, goal or need. At Dynamic Transitions in New York City, we offer a variety of consulting services for organizations, from solving a problem over time to giving a one-time talk at a company event. We understand that your business faces unique challenges, and we customize your consulting experience according to your organization’s goals and how long you want us working with you – from one hour to several months. Consulting has been shown to be particularly effective when an organization and its members are truly committed to the process. A neutral business consultant can help you identify organizational, communication and staff issues, and develop strategies that work in your specific company and industry. We believe in a collaborative approach and partner with you to develop appropriate interventions, plans and solutions, and empower you to implement them. When you understand the barriers and blind spots that are impacting the success of your staff and partners, you can address problems before they do any more harm to your business. When you bring in Dynamic Transitions as a consultant for your organization, we help you analyze the problems your company is facing, as well as develop and implement effective solutions. Once we develop an appropriate understanding and sense of your organization’s operations, goals and challenges, we may set up discussions with key staff and stakeholders. This allows us to develop a tailored plan of action and conduct training where needed – in leadership or communication, for example. Finally, we work with you in steady intervals to evaluate the progress your company is making and update strategies and training as needed. In this way, you gain more than a business consultant. You now have an invaluable resource. At Dynamic Transitions in New York City, we are licensed counseling psychologists with substantial training and professional experience in diversity and cultural competence, team cohesion, leadership development and group dynamics. For 15 years we have helped non-profit organizations and businesses identify and address inefficiencies and problem areas. It is possible to change the existing dynamics that are causing dissatisfaction or problems with productivity. With support and the appropriate intervention, you can improve staff morale, retention and productivity and enhance the overall workplace environment. Every experience you have with a business consultant is an opportunity for change, but that doesn’t guarantee that a consultant’s approach is the best fit for your company. At Dynamic Transitions, our approach is tailored and collaborative. We take the time to define the problem you are facing and develop sustainable solutions. Having an outside business consultant tell you how to manage your business can feel intrusive and threatening. Therefore, we strive to create a collaborative experience with buy-in at all levels of the organization. We offer a strengths-based consultative experience. Together, we’ll explore the positive aspects of your organization and what’s working, as well as develop solutions your staff and stakeholders can endorse. You don’t know anything about our line of business. How can you help? We understand that you are the expert in your field, which is why we work through a collaborative organizational consultant model. Our expertise lies in understanding people in the workplace and organizational dynamics. We have extensive experience in leadership development, workplace diversity and interpersonal issues in the workplace, which allows us to provide valuable contributions to help your organization boost productivity, increase employee engagement and raise staff morale, resulting in better retention and improved outcomes. If your non-profit or business is struggling with staff morale, cohesion or productivity and you need a helping hand or if you have additional questions, we invite you to schedule a free phone consultation.